Scene outside Inland Regional Center in San Bernardino after gunmen opened fire, killing 14 people on Wednesday, Dec. 2, 2015. SAN BERNARDINO, Calif. (KABC) -- Police said 14 people were killed when a man and woman opened fire at the Inland Regional Center in San Bernardino on Wednesday. Two suspects who were killed in a dramatic shootout with officers have been identified. Police identified the suspects as 28-year-old Syed Rizwan Farook and 27-year-old Tashfeen Malik. Officials said Farook and Malik were believed to be married or engaged. Police confirmed Farook was born in the U.S. and was an American citizen. Farook and Malik fled the scene in a black SUV. At approximately 3:15 p.m., police officers chased down the SUV, which crashed a few miles from the regional center. Video from the scene showed the SUV riddled with bullets. Both suspects were pronounced dead at the scene. An officer was also injured, but the injury was non-life threatening. San Bernardino authorities were involved in a shootout with suspects inside a dark SUV following a short chase on Wednesday, Dec. 2, 2015. Officials said Farook and Malik were dressed in assault style clothing and had assault rifles. The ATF said two rifles and two handguns were recovered in their investigation and officials are working to trace the serial numbers on the weapons. Officers swarmed a neighborhood about a mile from the SUV shootout, apparently in a hunt for a possible third gunman. A person seen running from the scene was detained, police confirmed. Officials would not call the person the third suspect, but just a person of interest. Police said later Wednesday evening that they now have reason to believe that Farook and Malik were the only shooters involved. Officers also searched a home several miles away in Redlands, which officials said was connected to Farook and Malik. Around 11 a.m., a shooting was reported at the Inland Regional Center, a nonprofit that works with individuals with developmental disabilities, at 1365 S. Waterman Avenue. The complex is comprised of three buildings. The attack took place in a conference area where the San Bernardino County Department of Public Health was holding a banquet, said Maybeth Field, president and CEO of the social services center. She said the building houses at least 25 employees as well as a library and conference center. Police confirmed Farook was an environmental specialist for the department of public health and had worked with the county for five years. Farook attended the banquet, but left early when he became angry, and according to police, the shooting followed shortly after. "They came prepared to do what they did, as if they were on a mission," San Bernardino Police Chief Jarrod Burguan said. Authorities said one device in the Inland Regional Center was believed to be an explosive, but federal law enforcement officials said it was later determined to be simply a piece of pipe. PHOTOS: Mass shooting incident in San Bernardino, Calif.
See images of the mass shooting incident in San Bernardino, California. Loma Linda Hospital officials said five people wounded in the shooting were in their care. They confirmed two were in critical but stable condition, two others were in fair condition and the remaining person's condition was not available. Inland Regional Center employee Brandon Hunt told Eyewitness News that the auditorium is regularly rented out to outside agencies. Hunt said approximately 550 people typically work at the facility at any given day. Courts, schools and other facilities in San Bernardino were placed on lockdown for security. The Inland Center Mall was shut down for the day as a precaution. The mall was evacuated and employees were sent home. A map indicates the location of the Inland Regional Center, 1365 S. Waterman Avenue in San Bernardino. 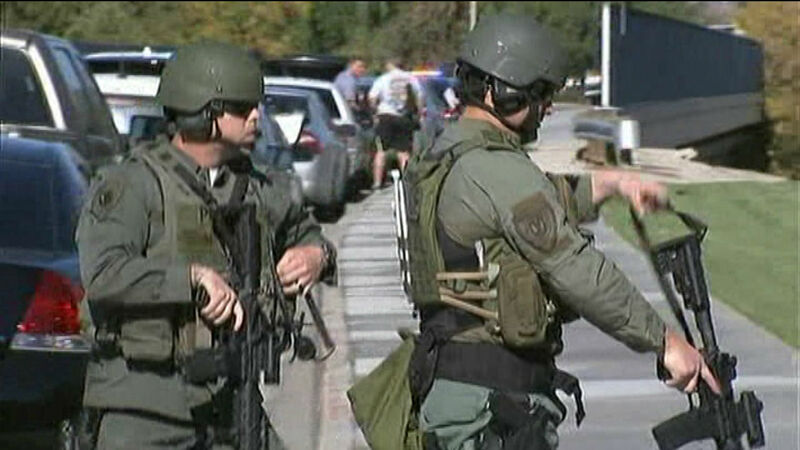 San Bernardino Unified School District officials said more than 70 schools were placed on lockdown as a precaution. Shortly before noon, dozens of people were seen exiting the building with their hands up. Marcos Aguilera's wife was in the building when the gunfire erupted. He said a shooter entered the building next to his wife's office and opened fire. "They locked themselves in her office. They seen bodies on the floor," Aguilera said, adding that his wife saw ambulances taking people out of the building on stretchers. Aguilera said his wife was able to get out of the building unharmed. Terry Pettit said he received a text message from his daughter, telling him that gunmen were in her building and that she and some co-workers were hiding. 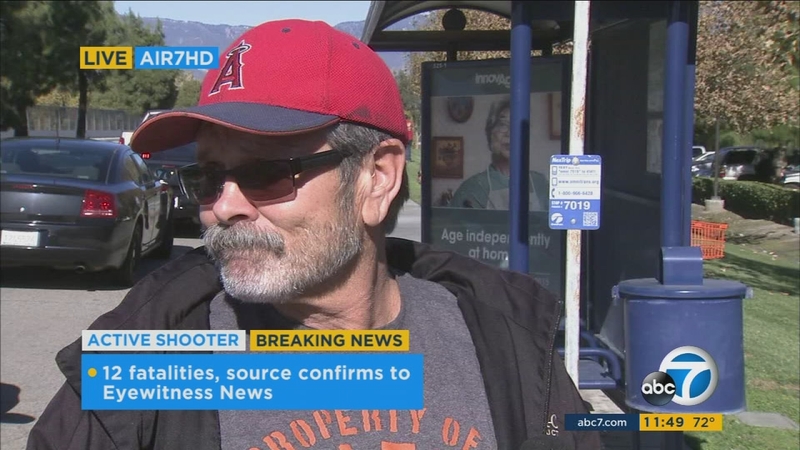 A father said he received a text message from his daughter, who works at the Inland Regional Center in San Bernardino, that gunmen were in her building and that she and some co-workers were hiding. Multiple agencies were working together on scene. FBI and ATF agents responded to the scene to assist local authorities. The White House said President Barack Obama was briefed on the situation. Obama later addressed the shootings saying in part, "Obviously, our hearts go out to the victims and their families." "The one thing we do know is that we have a pattern now of mass shootings in this country that has no parallel anywhere else in the world," he continued.